Pauline Bestley is the current Director of the Action Man Programme. After a long career working with several holders of the Action Man mantle, Bestley is an analytical, no-nonsense woman. However, this puts her at odds with new Action Man Ian Noble, and she often finds herself having to rein in the impetuous young agent. 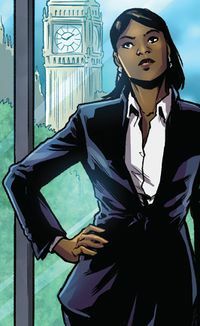 Nevertheless, Bestley possesses the cool-head required to do her job to protect England and the world. Born in London, England, Pauline Bestley is the daughter of a Zimbabwean immigrant and British diplomat. As a child in Cathollic School, she learned to read and analyze other people, a skill that would prove invaluable in her career. After graduating from Magdalen College, Oxford, she was recruited into the Secret Intelligence Service, where she worked with the such heroes as Action Man, Adventure Team, and Operational Support. After helping take down the "Council of Doom," Bestley was hired to the Action Man Programme by Patrick Cain. This article about a Action Man-related character or concept is a stub and is missing information. You can help IDW Hasbro Wiki by expanding it. This page was last edited on 30 March 2018, at 15:20.